Whether you are a beginner or an advanced triathlete, open water swimming will always be a challenge. Good open water swimming takes technique, endurance, power, strategy, and adaptation. 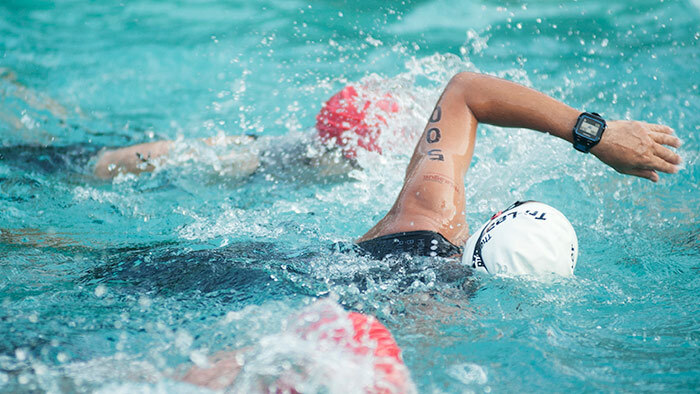 Among triathletes, it is easy to identify two profiles of swimmers. First, there is what I call the “technical hermit”, as referred to in the Swim Smooth terminology. This swimmer type tends to develop the perfect stroke and insists on perfection before pushing the engine. Second is the “endurance junkie”. This swimmer is happy as long as he or she is logging enough laps. Quantity rules here and they are beaming if they have logged in more than the previous week! I will address the drawbacks to each of these approaches and suggest ways for each swimmer type to re-think their approach in order to improve. Most of the time this athlete dislikes getting out of his or her comfort zone during swim training sessions. By completing three to four technical sessions per week, and without real intensity, the technical hermit will feel engaged and reassured as the log reflects lots of time in the pool. I see many athletes who think that they are not ready to do threshold or endurance sessions because their technique has not yet been perfected. This path is unfortunately not the most efficient for beginners or elite level triathletes. If you are too much of a perfectionist you will only postpone the time where you will have to work out of your comfort zone. Consequently, you may find yourself reaching your peak way too late in the season. Getting your technique together at low speed is not really efficient if you can’t use it at race pace. This requires adaptation from your mind and your body. It’s very common to me to see swimmers with a very nice technique in “relax mode” that falls apart as soon as they try to push up the pace. Accordingly, and this is of great importance, make sure you develop your technique and your speed, power and endurance at the same time. If you are not a “natural swimmer” and did not practice competitive swimming in your childhood, you will de-train very quickly without consistent training. Contrary to running or biking, swimming doesn’t require you to have to support your body weight. Consequently, it demands much more repetition to create a physiological effect on your muscles. If you don’t maintain enough fitness in your training you may look good on a few 50m and 100m repetitions, but as soon as it gets any longer your swim will fall apart. Don’t forget that you are a triathlete and you have to balance the swimming with the two other sports. Most of us focus on improving our swimming during the winter, when biking and running outside may be challenging in certain parts of the world. Swimming offers the perfect environment to maintain your fitness regardless of outside conditions. Every spring among our squad I love to witness these new triathletes breaking their record during the spring 10k or half-marathon while they focus on their swim, taking a step back in running. Indeed, there is a direct correlation between increased swimming sessions (if done properly) and improvement in the other two disciplines. So be careful on balancing your training. If you take it too easy on the swim it may have a negative fitness impact on your running and biking. The endurance junkie is mostly concerned with getting in as many intervals and kilometres as they can. Often, these sessions have no specific goal other than reaching 10, 15, 20 or even 30km per week. It may also reveal a lack of confidence or give assurance to the beginner. This athlete will see their level increase rapidly at the beginning, but will reach a plateau after a few months. This type of swimmer will react by adding more volume and more intensity, without seeing much improvement. They will then back off to concentrate on other sports, and start all over again, with the same pattern at the end of the season. No you are not losing time when doing technical session, as long as you know why you are doing each drill and focus on one point at a time. No, using fins is not cheating, and yes, the pull-buoy must be used with intelligence. However, don’t use it all the time using the excuse of a hard running session the day before. This approach will undoubtedly hide some weakness in your stroke and slow down your progression. Think quality and not quantity during these sessions. If needed, don’t be afraid to draw a line down to resist the temptation to go to fast and ultimately miss the point of the drill. Your swim sessions will be much more efficient if done with in “fresh state”. Resist the temptation of postponing this session towards the end of your training day. Ideally, and especially if you want to focus on your swim, place them early in the morning. Your mind and body will be 100 percent ready to assimilate the work. If you have no choice but to put the swim session after a hard run or bike session, you may consider skipping one of these two sessions. Essentially, you’ll find yourself accumulating more benefit by resting, taking some time off for your family instead of spending 90 minutes at the pool for nothing else than accumulating fatigue. This sounds simple yet most of the athletes I’ve had the pleasure coaching don’t always follow the path of a well-balanced training because it is requires patience and constancy. As explained above, mixing technical work with fitness training is the best way to develop your stroke. You are a triathlete and this requires some specific training and a specific technique adapted to open-water and long distance. In Track and Field you will never envision a trail runner train and run the same way as a 100m sprinter, but how many triathletes are joining swim master classes who prepare mostly for 50 to 400m pool races. You need to develop your own style depending on your personal characteristics and goals. There is no “one stroke fits all”, but there is a stroke that fits you best. In addition to squad sessions including technical classes, spending a one to one session with a professional coach every two to three months may help you refine your stroke and adapt it to your next goal. A one-on-one session can be very efficient. They can be expensive, but don’t worry, it is not necessary to do one every week. A well-driven session with video analysis will give you plenty of homework for a few months. The most important aspect during these sessions is that you should understand what slows you down and you should go through the process to correct it. Of course, it will then require weeks of work on your side to assimilate the technical changes It takes on average about 6 weeks to assimilate one change. So be patient and don’t forget to keep the intensity and endurance in your training. Swimming is a challenging sport to take up as an adult. The right mix of technique and fitness is required to see improvement. Balancing your training will allow you make improvements and ultimately lead to faster swim times. Bart Rolet is founder and head coach of BartCoaching offering private coaching for triathlon. He also runs'La SwimSquad Montréal,'one of the largest squad in Canada with 150 swimmers and 9 sessions per week. He is certified by Triathlon Canada and is in the final step to become the first Swim Smooth certified coach in Canada. He is also a competitive triathlete and experimented Ironman including three sub 10 races in Kona.